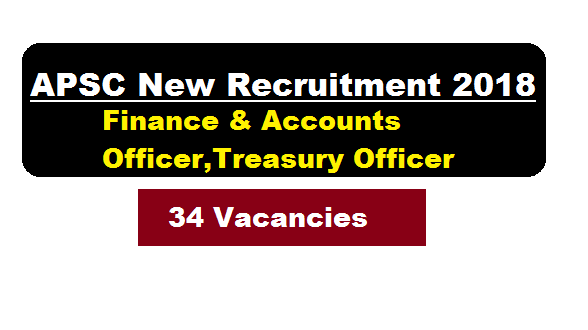 APSC Recruitment 2018 | Finance & Accounts Officer,Treasury Officer – Assam Finance Service Examination, 2018 : – Hello everyone Assam Public Service Commission has recently published a rceruitment notification. According to the latest APSC Recruitment 2018 July notification, The Assam Public Service Commission will hold a competitive examination for filling up of 34 (thirty four) posts in Class-I, Grade III cadre of Assam Finance Service including the post for reserved categories in the revised pay scale of P.B.-4, Rs. 30,000/—1,10,000/-with Grade Pay of Rs.12,700/- plus other allowances as admissible under rules against Advt.No.12/2018. We have discussed in details about this New APSC Recruitment below. In this section, we will discuss in detail about Recruitment of various jobs under APSC Recruitment 2018 July-August with all the details and requirement. Application Fee: Treasury receipt for Rs.250.00 (Rupees Two hundred and fifty only) for General candidates, Rs.150.00 (Rupees One hundred and fifty only) for candidates belonging to SC/ST/OBC/ MOBC community as fee for the direct recruitment to the post of FAO/TO (Class I, Grade-III) of Assam Finance Service in the Finance Estt. (B) Deptt. under the Head of Account viz. “NON TAX REVENUE, OTHER NON TAX REVENUE 0051 PUBLIC SERVICE COMMISSION, 105 STATE PUBLIC SERVICE COMMISSION / APPLICATION FEE RECEIPT OF THE ASSAM PUBLIC SERVICE COMMISSION” as per Finance (Estt.-A) Department’s Notification No.FEG 32/2016/8 dated 28th October, 2016 furnished along with the Personnel-(B) Department’s letter No.ABP.60/ 2014/11 dated 02-02-2018. The fees are not refundable and no other mode of deposit of fee other than through Treasury Challan shall be accepted.No application fee for BPL and PWD Candidates. 2/ One copy of recent passport size photograph to be properly pasted on the space provided in the application form with good quality adhesive/ glue. Another copy should also be enclosed with the application. 3/ Age-proof certificate (Admit Card/ Certificate of HSLC or equivalent exam). 5/ Caste Certificate in respect of candidates belonging to SC/ST/OBC/MOBC community issued by the competent authority. 6/ ID Card/ Certificate in respect of PWD candidates issued by the competent authority.